Special education supervisors Dr. Geraldine Ryan-Washington, Danielle Fowlston, and Timothy Murch provided the Board with an overview of the district's Extended School Year program, detailing how students are screened for the program. This presentation can be viewed on the district's website. Dr. Zerbe presented the Board with a progress update on the Methacton High School athletic fields improvement project. This presentation may also be viewed online. All other items listed on the April 28 agenda were approved, with the exception of item 9.4, which was tabled. Congratulations, Arcola Science Fair Team! 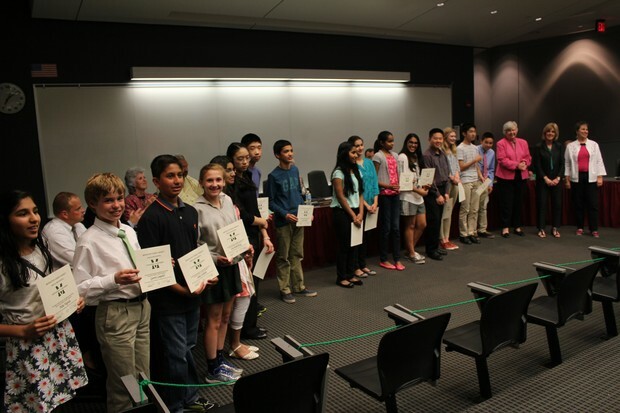 "M" Awards were presented to the following members of the Arcola Science Fair team for earning first place at the Montgomery County Science Research Competition: Davron Borhan, Garrett Campbell, Jonathan Cheng, Alden Ford, Saket Gokhale, Erin Hardenburg, Julia Jablonski, Brian Lee, Ryan McShane, Amy Ouyang, David Palko, Sonia Patel, Shreya Patil, Will Rebert, Harsha Santhanam, Ashmitha Sivakumar, Conor Smith, Justin Suh, Arushi Tiwari and Claire Tse. 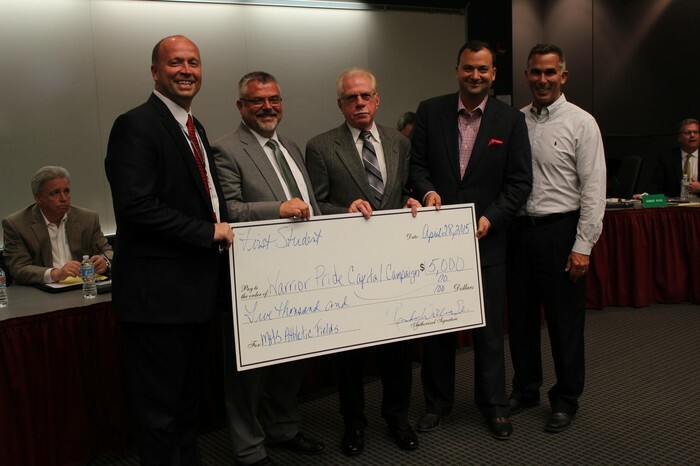 First Student representatives presented a $5,000 contribution to the Warrior Pride Campaign during the Board Meeting. Pictured left to right are Superintendent Dr. David Zerbe; First Student Area General Manager Randy Williams, Sr.; First Student Location Manager Charlie Hoffmann; School Board President S. Christian Nascimento; and School Board Director Gregory Pellicano. Read past 2014-2015 editions on the Intranet. The Methacton School District's Board of School Directors meets each month. Committee meetings of the Board are typically held on the first three Tuesdays of the month, followed by the regular board meeting on the fourth Tuesday (except during the month of December). Regular Board meetings take place in the MHS LGI, and all residents are invited and encouraged to attend. Committee meetings may take place in the Board Room at the Farina Center, or the MHS LGI. Meeting agendas are posted to agenda manager, and start times and locations are posted on the District's website. Please confirm meeting time and location before attending. Download the meeting calendar here. Watch the meeting video online.